– Your getting ready room: Are there large windows where natural light can pour in, or is it a small room filled with fluorescent lights? I fell in love with the lovely bedroom where I would be getting into my dress and spending time with my bridesmaid, because of the large windows and light colored walls and decor. I knew it would make for a perfect light box for my photographers. – Ceremony space: Is it outdoors in a shaded area or in a dark church? I have always experienced Jesus in his beautiful creation and knew that we didn’t need to be married in a dark church for the Holy Spirit to be present during our ceremony. I loved the large oak trees and I knew that they would provide some even shaded light, with just enough that would be coming through their branches during our ceremony. – Portraits: If the weather permits, plan to do all your formal portraits outside, even if you are married in a church. Most brides think that they have to do portraits at the altar, because that’s what the church lady says. Remember – this is your wedding day! You can call those shots. I loved our space because our whole wedding was held outdoors and I knew that the outdoor portraits would be my favorite. – Wedding details: Will your reception take place outdoors, in a dark ballroom, or under a dreamy tent? 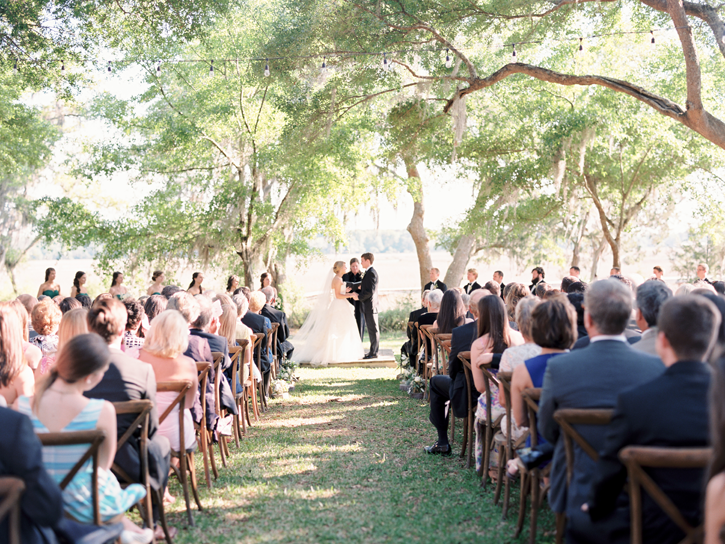 We chose to host our wedding dinner outside because I loved the thought of our guests eating under the oaks with a gorgeous view and because I knew that our wedding details would photograph lovely in these accommodations. Please don’t be discouraged if after you are reading this you are not happy with the light situation in your wedding. A good photographer can photograph a wedding in any light situation! If you are dealing with a lot of dark lighting, I can not tell you enough: trust your photographer and tell them that natural light is important to you. There are many alternative ways to stage moments happening that don’t take place in those dark spaces. For example, if you are getting ready in a dark underground room of a church, put your dress on and then ask your photographer if you can go outside to take a couple more pictures of you zipping up your dress and putting your accessories on. We have found that the best time of the day for portraits in 1.5 – 2 hours before sunset. If possible, plan your ceremony time around this parameter, so you can have your portraits done directly when your ceremony ends. And again, trust your photographer and be willing to go along with their direction. I will never forget when it was time for Jamie and I to do our portraits: Nancy told me that we were going to wait a little bit longer so that the sun could go down a little bit more. So we went on with our evening, ate dinner and then she came back to get us when she felt the lighting was just right. And remember : your wedding day timeline should not look like mine if you are getting married in the fall or winter! Check the sunset for your specific day before you begin planning. Best wishes for beautiful light on your big day!